Nahr al-Bared refugee camp in north Lebanon (Al-Jazeera TV, September 2, 2007). 2. There were a number of cease-fires which were violated after a short time by both sides. The Lebanese army showed itself to be determined and persistent , but could not rapidly overcome the Fatah al-Islam operatives, who fought stubbornly against superior forces and succeeded in holding out for several months. 3. The fighting took place in the Nahr al-Bared refugee camp (population 40,000) north of Tripoli . Most of the camp’s inhabitants fled when the fighting broke out. As the fighting continued, the Lebanese army allowed other inhabitants, including family members of Fatah al-Islam operatives, to leave, in order to reduce the number of casualties and to make it easier to focus on fighting Fatah al-Islam strongholds. 4. During the first week of battles the Lebanese army increased its forces in Tripoli , encircled Nahr al-Bared, took positions in commanding areas and shelled the refugee camp with artillery and tank fire. At the beginning of June, after ten days of encirclement, the Lebanese army attacked the Fatah al-Islam strongholds inside the refugee camp and waged street fighting in the alleys. Fatah al-Islam operatives returned mortar and rocket fire . 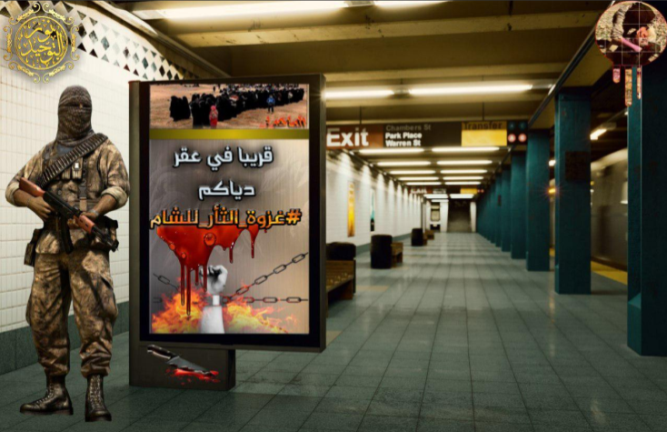 To reduce Lebanese army pressure within the camp, on June 17 global jihad elements launched rockets at Kiryat Shemona 2 and harmed UNIFIL forces. The attacks did not influence Lebanese army pressure in Nahr al-Bared. 5. The battles ended on September 2 when several dozen Fatah al-Islam operatives who had remained in the camp tried to break through the Lebanese army encirclement. Most of them were killed and Lebanese soldiers, with backup from the air and the sea, began searching the area for operatives who had escaped. The Lebanese soldiers killed 30 of them and completed their takeover of the camp. Several Fatah al-Islam operatives were killed by armed civilians who had accompanied the Lebanese soldiers in pursuing them (Al-Akhbar, September 3). 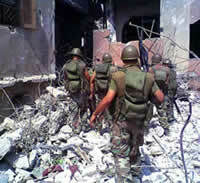 In the days after the final battle, the Lebanese army finished the search for escaped operatives and forces which had participated in the battles returned to their bases in Beirut and other locations in Lebanon . A Lebanese army roadblock on the outskirts of the Nahr al-Bared refugee camp at the beginning of the battles (alwatanvoice.com, May 21). Lebanese army soldiers on patrol in the Nahr al-Bared refugee camp (Al-Sharq al-Awsat, August 11). Smoke fills the sky over the Nahr al-Bared refugee camp (Al-Nahar, August 14). B. Some of the operatives entered the country through official border crossings, including the Beirut airport. Others infiltrated by other means . 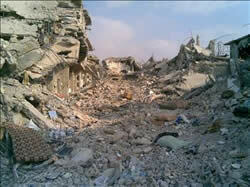 C. Most of those who were killed were Palestinians from refugee camps in Syria and Lebanon . Some of them were Syrian and others held various nationalities. D. The Lebanese government and UNRWA have prepared a program for the rehabilitation of the Nahr al-Bared refugee camp, which was almost completely reduced to rubble. UNWRA has purchased lands near the camp to build temporary dwellings for the refugees and temporary schools for the camp’s children. 7. According to Elias al-Murr , the Lebanese minister of defense, at least 222 Fatah al-Islam operatives were killed (including organization leader Shaker al-Abassi and other members of the leadership) and 202 were captured by the Lebanese army . In addition, 163 Lebanese soldiers and at least 42 civilians were also killed (Reuters, September 4). 8. Shaker al-Abassi, who was Jordanian, held several important posts in Al-Qaeda in Iraq and was involved in terrorist activity in Jordan . 4 His wife and two operatives identified his body in the hospital (AP, September 3). 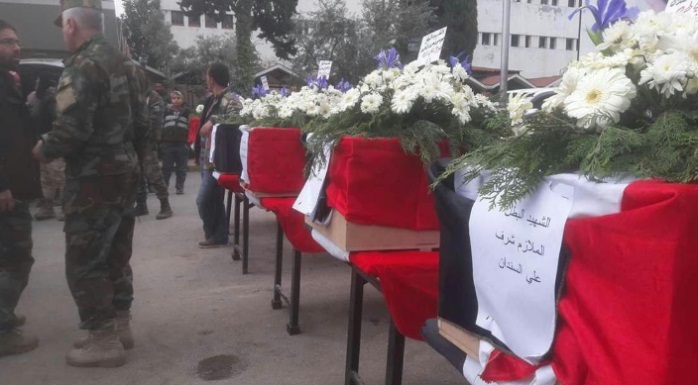 5 Many operatives who were killed were foreign nationals, and came from countries such as Saudi Arabia, Yemen, Syria, the Palestinian Authority and even Serbia and Chechnya (Al-Hayat, September 3). 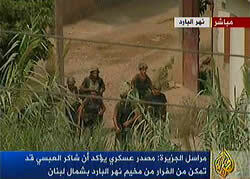 The last day of battle: Lebanese army soldiers looking for Fatah al-Islam operatives who fled from the Nahr al-Bared refugee camp (Al-Jazeera TV, September 2). 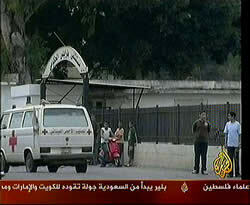 An ambulance evacuating the body of Shaker al- Abassi, Fatah al-Islam leader (Al-Jazeera TV, September 3). 9. The Lebanese army’s conquest of the Nahr al-Bared refugee camp and overpowering of the Fatah al-Islam strongholds is an exceptional event, the first of its kind . In the past the Lebanese army either operated on the outskirts of the Palestinian refugee camps or shelled them from a distance, but refrained from entering and taking them over . For the first time since the rehabilitation of the Lebanese army after the civil war, it fought actively, for a relatively long period of time in a densely built-up area, combining tanks, infantry and artillery. 11. The victory in Nahr al-Bared was an achievement for Fuad Siniora’s government and has strengthened it in its struggle against its rivals during the sensitive period before presidential elections . 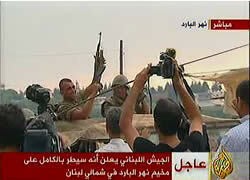 It was an unprecedented decision to send the army into a Palestinian refugee camp to overthrow entrenched terrorists. There were a number of factors behind the decision: the Lebanese government’s understanding of t he dimensions of the threat to Lebanon posed by the global jihad and the need to take strong measures against it, the broad internal support for steps taken against the global jihad, and the external political support (along with military aid) it received from the United States and the pro-Western Arab countries . Nahr al-Bared refugee camp (Al-Mustaqbal, September 4, 2007). 1. Lebanese president Fuad Siniora proclaimed the Lebanese army victorious. 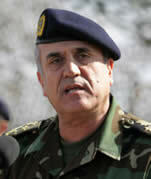 He congratulated the army and boasted that it was a huge achievement, parallel to that of Hezbollah over Israel . He said that the victory proved that the country and its legitimate forces were able to protect Lebanon and stressed the important of deploying the army throughout country (Lebanese News Agency, September 2). His statements provide an indirect response to Hezbollah , which represents itself as " Lebanon ‘s shield,” using the claim to justify its refusal to disarm. A. Sa’ad al-Hariri , Fuad Siniora’s political ally, stated that the Lebanese army takeover of Nahr al-Bared meant the end of the "al-Abassi gang,” which had hidden behind the name of Islam and tried to destabilize Lebanon and cause a civil war. He noted that it was a glorious day for the Lebanese army "which enjoys a very high status alongside the resistance [i.e., Hezbollah] in south Lebanon ” (Al-Mustaqbal, September 3). B. Elias al-Murr , the Lebanese defense minister, said that the victory had rooted out a terrorist organization which had threatened the Lebanese people and spread throughout Lebanon like a cancerous growth (Reuters, September 4). C. General Michel Suleiman , Lebanese army commander, sent an order of the day praising the soldiers of the Lebanese army for their courage and willingness to sacrifice their lives for the sovereignty of Lebanon and national honor. He called upon them to keep their rifles aimed at " the Israeli enemy ” and "the evil terrorism lying in ambush for the homeland” (Lebanese News Agency, September 3). 3. Hezbollah, which kept a low profile during the months of battle in Nahr al-Bared refrained from praising the Lebanese government for its achievement. The organization was motivated by the fear lest the victory strengthen Fuad Siniora’s government, harm Hezbollah’s image as " Lebanon ‘s shield” and renew the demand that it disarm. 4. Hezbollah attacked Elias al-Murr, called by Al-Manar TV the minister of defense of the illegitimate government because of what he said when the battle ended. The Hezbollah commentator was furious with Elias al-Murr because he did not thank Syria for having provided the Lebanese army with weapons and ammunition, he supported the United States’ war on terrorism and because the government, Al-Manar TV claimed, had exploited an event with national import for Lebanon for its own political needs, while harming the Lebanese army’s neutrality (Al-Manar TV, September 4). 5. On the other hand, Nabih Berri , head of the Lebanese parliament, leader of the Amal movement and a Hezbollah ally, congratulated the Lebanese army commander. He said that it was a glorious day for the Lebanese army, however, he added that the army enjoyed a firm status alongside the "resistance” [i.e., Hezbollah] in south Lebanon (Al-Mustaqbal, September 3). 6. Michel Awn , a Christian ally of Hezbollah, who doesn’t miss an opportunity to attack the Lebanese government, demanded an inquiry committee be established to investigate the failures of the Lebanese government and of military intelligence which led to a campaign of 106 days between the army and a terrorist organization and to the death of 154 soldiers and officers . The main point of his claim was that "the Lebanese army was neglected for many years and did not receive either the equipment it needed or proper training to fight a war against terrorism” (Lebanese News Agency, September 2). 7. 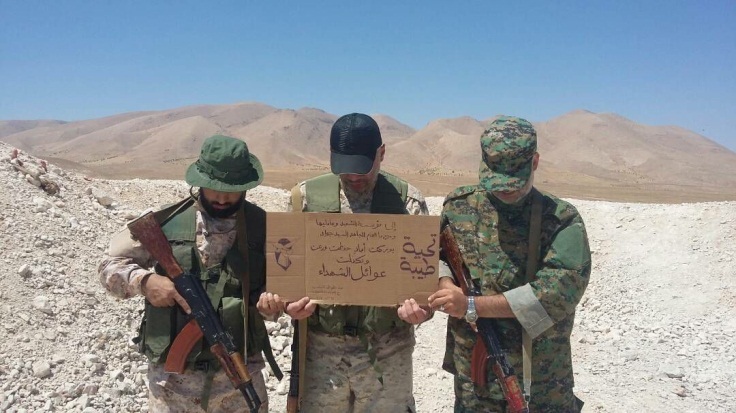 While visiting Tehran , Walid al-Muallem , Syrian foreign minister, congratulated the Lebanese army on its victory. 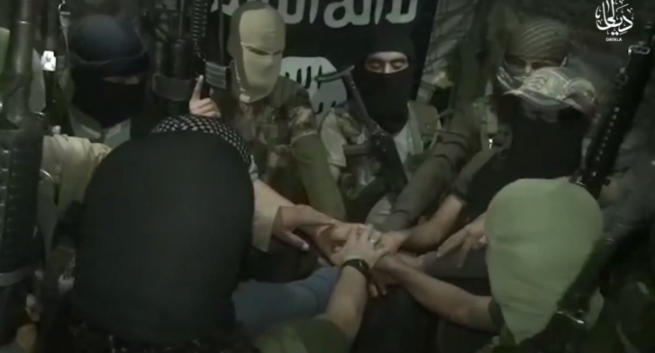 He called Fatah al-Islam "a group of terrorists” and denied any connection between it and Syria (Agence France Presse, September 2). 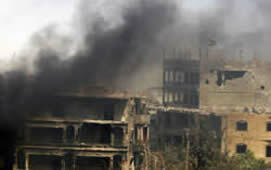 He also said that Syria had 26 members of the Fatah al-Islam leadership in custody (Al-Akhbar, September 4). 1 For further information see our May 31, 2007 Bulletin entitled "The confrontation in northern Lebanon between the Lebanese army and Fath al-Islam, the Al-Qaeda offshoot in Lebanon” . 2 For further information see our June 26, 2007 Bulletin entitled "Rockets fired on Kiryat Shmona for the first time since the second Lebanon war” . 3 François al-Haj did not mention the terrorist attacks planned by Fatah al-Islam. However, according to Lebanese sources the organization was planning to assassinate a series of Christian leaders, including Nasrallah Sfeir, the Patriarch, and to attack Lebanese government institutions in the north of the country. 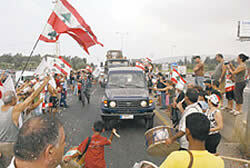 The high point was to have been the declaration of an Islamic emirate in north Lebanon (Al-Safir, September 4, 2007). 4 The Jordanian authorities allowed al-Abassi’s family to erect a mourning tent near Jabel al-Zuhour in the heart of Amman . Hundreds of people came to offer their condolences (Al-Arab al-Yawm, September 6). 5 According to unconfirmed reports, DNA tests showed that the body was that of Shaker al-Abassi (AP September 10). 6 That would also entail a one-time change in the Lebanese constitution, which requires a cooling-off period of two years between government offices. The daily newspaper Al-Hayat , referring to the lessons to be learned from the battles at Nahr al-Bared, noted that the importance of the victory is in its political implications, particularly the beginning of a dialogue regarding the next Lebanese president (Al-Hayat , September 6).